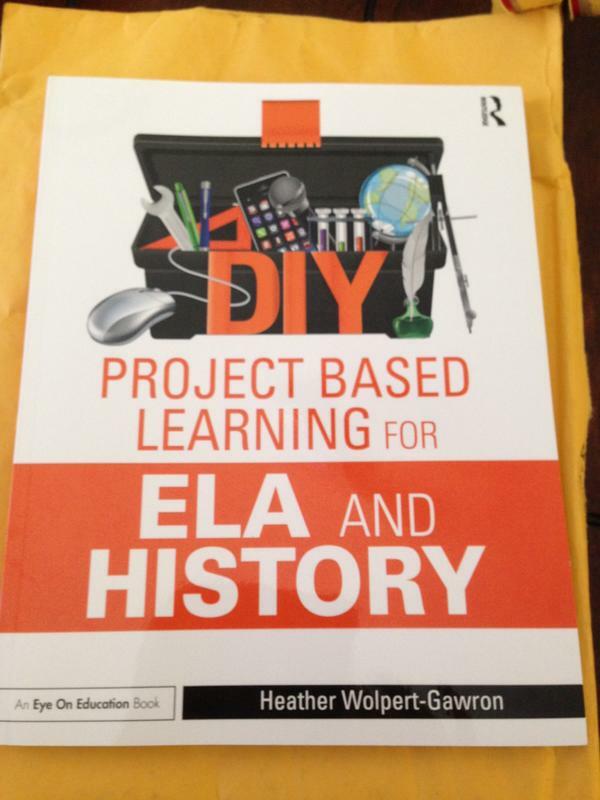 I’m excited to announce that my new book, DIY Project Based Learning for ELA and History has arrived and is now available for purchase. The point of the book was to break down the process of PBL into day-by-day chunks to give more educators access to a sometimes complicated, but rich and engaging, teaching strategy. It includes a wonderful foreword by the inspiring Suzie Boss, a series of complete units, including homework hints, rubrics, and student exemplars, as well as downloadable handouts and scaffolds that a teacher can mix-and-match to create a unique unit all their own. When you first get into the swing of teaching, I mean, when you first really start feeling like you know what you’re doing, your next step is to figure out what you really love about teaching. I’m not talking about why you do it. We all teach for many reasons: we love the students, we want to give back, we want to pass on a passion for a subject that we love, we want a reliable paycheck. All are great reasons to love teaching. But it takes awhile to get good enough at the science of teaching to then decide what you really love about it. For me, it’s curriculum design. I love telling a story through the lessons I design. I love developing units that really connect with kids, that really help them learn to communicate, and that really leverage the love of learning in order to achieve. Many Saturdays, one can find me at The Chado Tearoom in Pasadena, CA, laptop opened, clicking away, for hours at a time, devising some new unit of study for my students. The waitresses who know me are kind enough to seat me away from the main restaurant area and keep the tea and finger sandwiches coming until I rise from my dreamlike state of curriculum design. For me, imagining curriculum is like writing a tale of learning, and I can get lost in it. For me, it’s curriculum design. I love telling a story through the lessons I design. For me, imagining curriculum is like writing a tale of learning, and I can get lost in it. I’m like a student myself. Sometimes I write something that makes we laugh out loud, or sometimes I come a across a resource that makes me cry, one that I can see in the hands of my middle schoolers, causing them to feel something, sensing in themselves their own growth, and hopefully instilling in them a desire to share and communicate that resource with others much like I want to share it with them. When I was a new teacher, I found that many resources that were adopted in the classroom bored me to a different set of tears. I grew frustrated. I’d think: how can I transfer a love of learning of what I’m teaching if I don’t emotionally connect with the material? I didn’t understand why so many history textbooks were 3rd person, dry retellings of what could be amazing tales of true-life heroism and progress. I didn’t understand why, as much as I liked literature, Language Arts wasn’t more about the Art of Using Language. Why couldn’t we learn to communicate multiple content areas of our choice? Why did we always have to analyze books of our school’s choosing or short stories from some pacing guide if those narratives didn’t resonate with students or with me, the teacher? And as a teacher, it slowly made me mad. Life is storytelling, and I always wondered why our lessons and units couldn’t tell stories as well. Why couldn’t a unit be a vehicle for lessons that have a sense of purpose? Why couldn’t an assessment be more about the journey of learning than the snapshot-one-day-test to see what was learned? After all, much like becoming physically healthy, learning should be a slower process if it’s going to be long lasting. A quick series of lessons followed by a test is, as is going on a crash diet and then quickly defaulting back to weight gain, sure to result in equally temporary learning. So soon after I became a teacher, I found myself in my first teashop, surrounded by the required textbooks, and designing units that told stories. Stories about life, stories about achievement, stories about problem and solution. I had stumbled on a passion for developing units submerged in Project Based Learning. I found that there were others like me, other teachers who loved to tackle a wider and deeper methodology of teaching and learning. But few were actually designing these units themselves. I began field testing my units with other teachers, finding those that worked only for my students because of my own understanding of how to build the units, and finding those that seemed to work in many classrooms, not just those in which I delivered the instructions. This book represents some of my most popular units and the lessons that can be worked into any number of them. After all, one can pick up a book on Project Based Learning, but many of them out there are about the rationale of PBL, not the day-to-day implementation of it. This book, on the other hand, gives you both. And with access to the Why and the How, I hope that my passion for curriculum design is one that will help transform your own classroom. I hope you find the book helpful and I deeply hope it helps you and your colleagues to become more fearless in your own curriculum design. Even if the strategy you love is not PBL, I hope that whatever you love about education can be leveraged to help our students learn and grow under our care. Good luck to you all for your new school year, and happy curriculum designing! fifa16mall.com - fifa16mall.com Where were we?